When Sunday Breakfast Rescue Mission was founded in 1878, the Mission served hot cups of coffee and rolls to guests before church on Sunday. 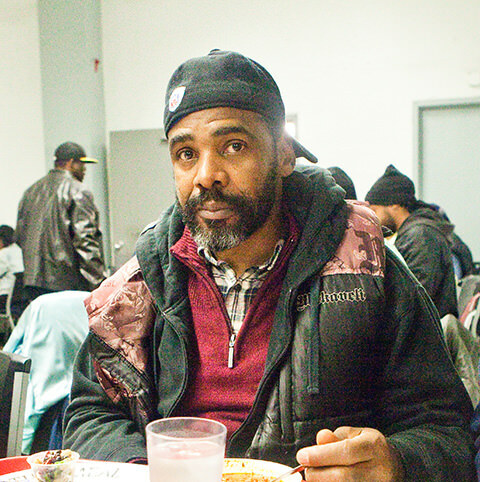 Through prayer, and the generosity of supporters like you, Sunday Breakfast is now the only free provider of three meals a day, 365 days a year to homeless individuals in Center City Philadelphia. Men, women, and children are welcome to share a meal with us any day of the week. At Sunday Breakfast we strive to provide nutritiously balanced, low-sodium meals. Each meal contains a fruit or vegetable and a protein. Our meals are made possible through community partnerships that generously provide food donations, which enable us to offer hearty meals to anyone who walks through our doors. We also depend on the generosity of friends like you, who host food drives that help stock the shelves each season! More than 400 meals are served each day! In order to supplement food donations, the Sunday Breakfast Farm generates fresh produce that the cooks incorporate into daily meals. Men that participate in the long-term Overcomer Program help maintain the Farm along with dedicated volunteers. The Sunday Breakfast Farm produces fruit like blueberries, raspberries, strawberries, and peaches, as well as vegetables like zucchini, tomatoes, cucumbers, and eggplant. Not only does the Farm yield fresh produce but it also teaches the Overcomers the importance of healthy eating and helps them obtain agricultural skills they can use to acquire future employment!